The personal injury law firm of Thompson & Evangelo, P.A., helps people in and around Mount Dora and Lake Mary, Florida, who have been hurt in an accident through no fault of their own. The board-certified lawyers at Thompson & Evangelo, P.A., have a combined four decades' worth of experience in personal injury and civil litigation cases, which means they guide their clients with confidence through what can be a difficult and sometimes traumatic process. Attorneys Paul Thompson and Nick Evangelo concentrate their practice on civil litigation, and they are board certified by the Florida bar in civil trial law. This means the law firm is focused on getting the best results for personal injury clients, including those who have suffered traumatic injuries, as well as the families of wrongful death victims. At our law firm, we know that motor vehicle accidents and other serious incidents can disrupt your life, your livelihood and ability to go about your everyday activities and enjoy time with your family. Our legal team will examine every detail of your case as if we are preparing for a trial. That way, if the options to settle or otherwise resolve your case are exhausted, we — and you — can feel confident that a favorable verdict can be reached. 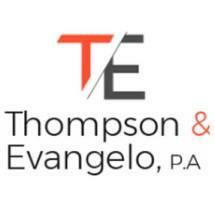 At Thompson & Evangelo, P.A., we accept no fee unless you receive compensation, and we believe in treating our clients honestly, fairly, and with dignity. Contact us today for a free consultation about your personal injury case.